The threat of an aggressively expanding communist ideology fueled the Cold War and dominated the policy of nine presidents. The United States was governed by nine successive presidents during the Cold War years. Each president had served honorably in the armed services. Several had been decorated for particular valor: Kennedy received the Navy and Marine corps medal and Purple Heart, Johnson was presented with the Silver Star, Ford was acknowledged with 10 battle stars, and Bush 41 was decorated with the Distinguished Flying Cross. Each understood the importance of balancing a decision that could send Americans into war measured against the need to protect the nation's security. The delicate balance they maintained during the Cold War with an arch enemy, Union of Soviet Social Republics, made them the ultimate gate keepers that saved the world from nuclear annihilation. Were the leaders of the Soviet Union equally adept, or were they convinced that they would lose a nuclear war? The threat of an aggressively expanding communist ideology fueled the Cold War. It significantly defined the legacies of the nine presidents that shepherded the destinies of generations of Americans. Who was this enemy? The 20th century political philosopher, Hannah Arendt, perceptively defined the foe as she drew the parallel between governments that were fascistic and communistic. Despite differing underlying ideologies, she noted that both were totalitarian, repressive domestically, and geopolitically imperialistic. It was inevitable that these philosophies would clash with progressive democracies, and ultimately Germans and Russians would bump heads with each other in World War 2. The Communist Party began its life as the Bolshevik movement when it seized the reigns of power in Russia (1917). It began with an ideology created by the social philosopher, Karl Marx. His communist Manifesto (1848) foresaw a struggle on behalf of laborers against their employers, the bourgeois middle class. He identified the communists as leaders of the working class and envisioned these leaders as spreading the gospel of revolution to all industrial nations. Class warfare was born, and the battle to export that ideology would become an international problem. The United States built as a capitalist society was not immune from this threat. 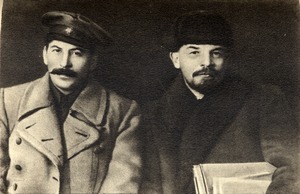 Vladimir Lenin, created a schism in the Bolshevik movement (1917), and he adopted a position in which power would be vested in a small group rather than a broad membership dependent on open enrollment. In contrast, the latter position was supported by the Menshevik faction of the Bolshevik movement. The Lenin movement then co-opted the power of the government and never relinquished it. The Mensheviks were out of business. Lenin left no room for options.
" --the communists seek to impose their design on other countries through terror, subversion, propaganda------United States is a permissive system challenged by one that is totalitarian". 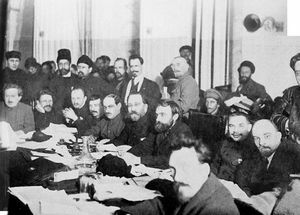 Lenin second from right at Bolshevik meeting. Although the Cold War generally dates it start from 1947, in February 1945, the seeds of discord were sown. 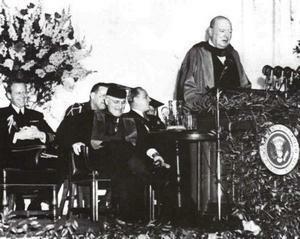 The three world leaders met at Yalta to divide the spoils of World War 2 that would end a few months hence. Soviet armies had occupied all of eastern Europe, and their troops were within marching distance of Berlin. They filled a governing vacuum over regions that had been under Nazi boots for six years. A fete accompli was etched in Europe's map. Almost a half century would elapse before cartographers could redraw the boundary lines. 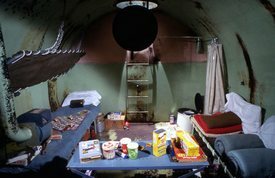 The Cold War was not merely a test of international wills, but had hot war and domestic components that touched all aspects of civilian life. It raised suspicions about the politics of neighbors, the loyalty of institutions, the patriotism of celebrities and instructions on building and stocking bomb shelters. The Americans and Russians post World War 2 agreed to become trustees of the destiny of Japan and some of their subjugated nations. 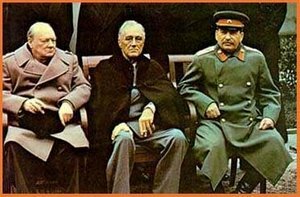 However those seeds were sewn at the Yalta conference 1945 when Roosevelt, Churchill and Stalin met to discuss post war Europe. Hence a somewhat informal division of Korea in 1946 and Vietnam in July 1954 (Geneva Conference) fell into the mix of dividing spheres of influence. The French were granted their sphere in Indochina. However the British, Dutch and French were returning to a part of the world that was already attempting to shed their colonial masters. 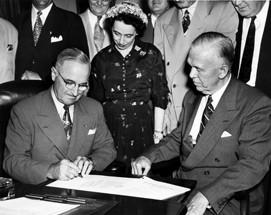 In 1946 , Truman's first full year in office, he announced the principle of support for free peoples against outside interference and inside armed minorities. There is no evidence that the president foresaw the conflicts that the spheres spawned in Korea and Vietnam, which at the time, were merely sideshows in international geopolitics. Balkanization was not limited to the far east. The control of Germany, and even Berlin, were divided into four zones: British, French, American, Soviet Union. The dearth of German men left manual labor in feminine hands in all sectors of Berlin. Despite the attempts of Britain and the United States to establish democratic institutions in Soviet controlled countries, they were not free of hypocrisy. The government of Greece, the birthplace of democracy, was seized by the army to prevent a communist take-over. The dictatorship of the generals prevented a free vote that might result in a communist victory. They were supported by Great Britain and America---- an overt manifestation of the "red scare". By 1947, European economic woes were opening the door for communists to win power in Italy, France and the Balkans. The communists had been the bulwark of partisan resistance across the spectrum of Nazi occupied countries. They remained a united force in the new peace era. Their call for the socialization of natural resources resonated with large elements of populatons throughout Europe. Great Britain had maintained troops in Greece to prop up a conservative dictatorship against an active and combative native communist movement. They appealed to the United States for help because of their own dwindling resources. Truman agreed to immediate aid. He wrongly believed that the Greek communists were puppets of Moscow. In fact, Stalin had been scrupulously observing the Yalta protocols as applied to the Balkan countries. Later events proved the Soviets hands off policy that resulted in the split between the Soviet Union and nascent communist governments in the Balkans. Within a year (1946), The Soviet Union attempted to reach an agreement with Turkey making it the guardian of the Dardanelles straits. Turkey resisted and the United States backed international control to protect the neutrality of the straits. The stalemate was broken when Truman ordered the fleet to the eastern Mediterranean. The USSR withdrew. This was Cold War by intimidation. Stark lines were drawn in 1946. A new phenomenon was evolving. 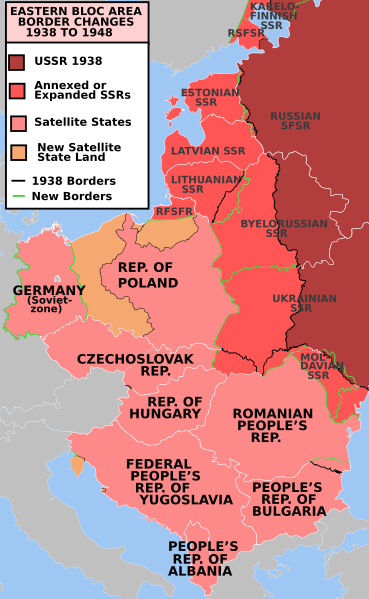 Regional blocs were emerging supporting either the communist ideology of the United Soviet Socialist Republics or the capitalist system of free societies led by the United States. Stalin preached the Lenin doctrine about the inherent incompatibility of communism with capitalism. Despite the harsh rhetoric---on both sides- the United States and the Soviet Union were reducing war time army size. George Kennan, observing from his Moscow post in the American Embassy, noted that friendly relations between the countries was not possible. His message to the State Department stated that the Soviets were "only sensitive to logic of force". In June 1947, Truman's Secretary of State, George Marshall, proposed a massive aid program for democratic, European governments. Its aim was two fold. It appealed to the humanitarian instincts of the American people, and simultaneously provided an economic recovery to act as a counterweight against the pressures from internal leftist movements. In the long view, the program certainly had economic success for donor and recipient. Democratic governments were stabilized and new markets opened for American products. Aside from Yugoslavia, the European communist threat was diminished. The effect on the growing number of third world countries, however, was problematic as was the reach of the Soviet Union in eastern Europe and Asia. The Soviets reacted immediately to American influence in Europe. They stopped American and British trains entering Berlin for passenger identity checks. Harassment would become a staple of Soviet policy. The United States was now recognized as the singular world power. No world geopolitical actions passed unnoticed by Washington bureaucracy. The scope of data required a new coordinating authority. The National Security Act provided for a cabinet position for a Secretary of Defense. The U.S. Air Force became an autonomous entity. Walter Lippman, a well respected journalist, wrote a series of columns in 1947, that were aimed at opposing the Truman doctrine of Soviet containment. The articles were called "The Cold War". The derivation of the term may have originated during the 1930s when Hitler was flexing German muscle aimed at intimidating the French. The latter referred to the Nazi actions as" la guerre froide". The CIA (Central Intelligence Agency) was established (1947) to coordinate diplomatic and military intelligence. Its predecessor, Office of Strategic Services (OSS) had proved in World War 2 the value of gathering independent intelligence. Communism and its prime advocate, the Soviet Union, were perceived as an existential threat to United States security. They had built a huge military and intelligence apparatus behind closed doors. Information as to its reach was carefully guarded behind an iron curtain. The CIA countered with its own spy network operating mainly through the U.S. ambassadorial posts world wide. Contrary to popular belief, spy networks were mainly composed of foreign agents recruited for internal intelligence gathering. However, the CIA used American journalists to help fill in the blanks. This practice was discontinued years later. Cold War History The National Security Council was tasked to empower covert activities in the CIA. The intent was to support underground, liberal guerrilla organizations in communist countries and encourage economic sabotage. This was particularly the case in Italy where the CIA funded non communist political parties. Through the years of the Cold War, their clandestine apparatus was key to the most significant policy decisions made in the White House. The CIA range dipped into and influenced an Italian election, operated in Central Africa, "arranged" for a coup in Iran. Alan Dulles, CIA director, exercised almost unlimited flexibility. It probably helped to have his brother, Secretary of State John Foster Dulles, back Agency actions. One of those acts took a page out of Nazi medical experiments. The intense fear of "Red" activities, spurred a similar approach. The secret MK-Ultra program had roots in 1950, it grew exponentially under several subsequent presidencies. The program focused on mind altering drugs such as LSD and heroin. The drugs were often administered to unsuspecting participants including military personnel, convicts, prostitutes and the mentally ill. The program was halted in 1973 and the file records were ordered to be destroyed by Director Richard Helms. Two years later, the Church congressional committee uncovered evidence of the program and exposed it to a shocked American public. All told, CIA activities, foibles and exploits, spawned a literary and film genre (historical and fictional) that guarantees the agency immortality. In the spring of 1948, France, Great Britain and the United States merged their West German zones and formed a single entity. France required American assurances that U.S. troops would remain as a deterrence against the potential of a future, aggressive Germany. The Soviets were not mollified by the extension of the presence of U.S. troops as a bulwark against a resurgent, militarized Germany. They claimed that the unilateral action of the 3 allies was proof that the design to ultimately unify all of Germany was abandoned by the west. ..
On June 18, a new currency was distributed in West Germany backed by the western allies. The Soviets were livid. They objected to the new Deutsche Mark which stabilized prices in western zones. They cut electricity in Berlin and halted delivery of food much of which was grown in East Germany. 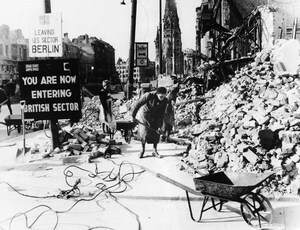 Stalin''s imposition of a blockade of roads entering into Berlin was another attempt to test the will of the west. It was met by a massive airlift on July 26 known as Operation Vittles. Early efforts were led by the British until enough U.S. planes were mobilized for the effort. The Soviets resort to harassment by broadcasting false radio signals. 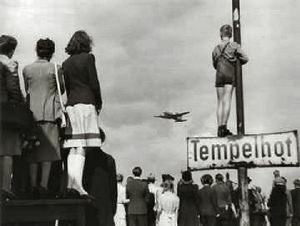 However, after one month 5,000 tons were delivered to American and British airports at Tempelhof and Gatow (see map above). The Berliners survived the intense winter. The British and Americans were landing supplies that included coal at a rate that exceeded what trains had delivered before the blockade. There was a price---25 aircraft were lost by the time the Soviets lifted the restrictions in July 1949. By that time, the three allied nations were creating a self governing West Germany. The Russian ambition to unify Germany under a Socialist Unity Party flag was thwarted. 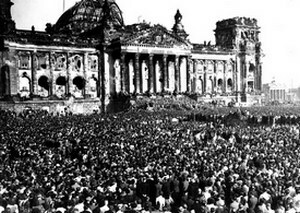 On September 9, 1948, citizens of Berlin staged an anti -communist rally with the old German Reichstag in the background. The Strategic Air command had been organized in 1945, but established under the command of the Joint Chiefs of staff in 1946. The bombers of the Eighth and Fifteenth USAF were transferred to the command of Curtis LeMay and the USAF in 1948. They would operate out of a Nebraska headquarters. At the time, the United States had only twelve atomic bombs. 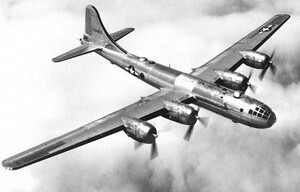 Aside from war time bombing duties in the Korean conflict, the B-29 began the duty of aerial reconnaissance along the Soviet borders flying at 30,000 feet at about 350 mph.It was not until 1951 that the SAC command received the swept winged B-47 jet slated for use for massive retaliation in case of war. 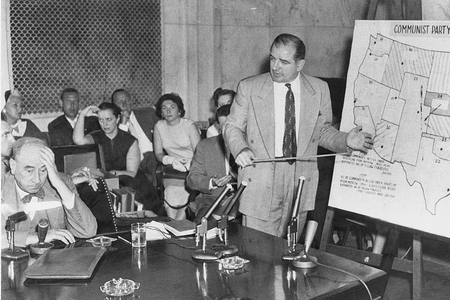 The anti communist drumbeat provided a launching pad for Senator Joseph McCarthy's (Wisconsin) witch hunt . In 1950, he accused the State Department of employing 205 communists. As Chair of a Senate subcommittee on Investigations, he used the privileges afforded a senator to level mostly unproved charges against scores of people--in and out of government. His favorite tactic was to accuse his critics of communist sympathies. 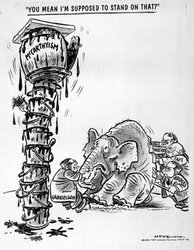 The cartoonist, Herb Block, coined the term, "McCarthyism". The "red scare" made for strange bedfellows. In exchange for overseas military bases, Truman had joined with a number of totalitarian regimes: Spain, Libya. Saudi Arabia. Truman also reached out to Chinese communists in the hope that he could engineer a split with the Soviet Union. That relationship abruptly closed when North Korean troops invaded South Korea in 1950. The Truman policy of containment became working policy for the United States for the next 2 decades. His presidential campaign touched a button with U.S. voters. In post World War 2, Americans gravitated toward greater patriotism with a strong undercurrent of religion. Eisenhower ("Ike") described Soviet Russia as the "anti-Christ". His choice of Richard Nixon as a running mate for the vice presidency was predicated on Nixon's strong anti -communist positions. In 1954, Ike added "under God" to the pledge of allegiance. Undoubtedly, religion made its adherents natural allies of the nation's leaders in the Cold War. Many of those leaders occupied the highest policy making positions. Secretaries of State, Dean Acheson, Dean Rusk were deeply religious. The Cold War was viewed as a "Christian Mission" and unified public support over forty years. On March 5, 1953, Joseph Stalin died, and with his death, the Soviet politburo was ready to abandon the Marxist-Lenin doctrine of an inevitable conflict with western capitalism. 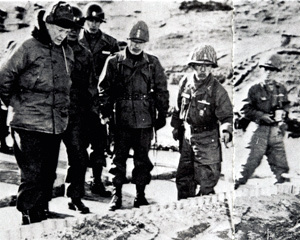 It was no longer an obstacle to a Korean armistice. The Russian who instigated the war in his life ended the war with his death. Even Communist China was ready to compromise on the repatriation of prisoners which had been a roadblock to ending the Korean stalemate. Anti-communist sentiment in the United States began to wane. The new First Secretary of the Communist Party of the Soviet Union, Nikita Khrushchev, pragmatically desired peaceful coexistence with the west. If for no other reason, than his fear of thermonuclear war. Eisenhower, his United States counterpart, had campaigned on ending the Korean conflict, but continued his support of the Truman foreign policy that required a strong military. "Ike's" caveat was that U.S. military power must be used wisely to insure world peace. His philosophy was to avert international threats through positive and preventive action. Despite his belief, Soviet power would increase during his years in office. The advantage in nuclear warheads, 10 times the amount in the Soviet Union, would diminish. At the very beginning of his term, the president was wrestling with a Soviet red line that would force his hand. He chose disarmament as a solution. In 1953 , he instructed Lewis Strauss to find an avenue for the United States and the Soviet Union to disarm their nuclear arsenals. The choice of Strauss at the Atomic Energy Commission (AEC) raises the question of this odd choice. Strauss was an unrelentant believer in Soviet duplicity. He must have told the president that any reduction or a suspension in production would result in a further Soviet clandestine build up. The Strauss position was supported by the president's Secretary of State, John Foster Dulles. He was on record that deals could not be made with the Soviet Union. The president would revisit the disarmament issue again in his first term. In May 1957, he addressed his concern about halting the arms race with Russia in a meeting with his National Security Council. Ike must have felt some ambivalence about reducing production of nuclear bombs or voluntarily imposing a test ban. It was in his power to have issued orders to effect these changes, but never did until August 22, 1958. He then decreed a one year test ban moratorium. 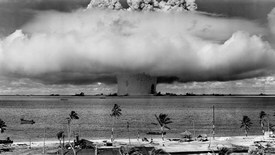 Even that order was breached when he allowed one more nuclear test after the effective date of the ban. Great Britain was quite unhappy because it was about to test its own nuclear device in the Pacific. By 1958, there were 81 tests conducted by all nuclear powers. The resolve of the Eisenhower administration, a strong military and massive retaliation, was tested in October 1956. Hungarian students took to the streets of Budapest to protest pro Soviet government repression. When the state police fired on them, a revolt against the government spread across Hungary. The Soviets replaced the government with a temporary premier, Nagy. He was unexpectedly sympathetic with the revolt and attempted to withdraw Hungary from the Soviet controlled Warsaw bloc countries. 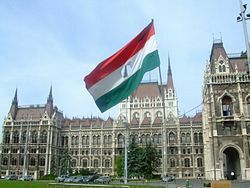 Hungarians seized the parliament building and flew their flag. 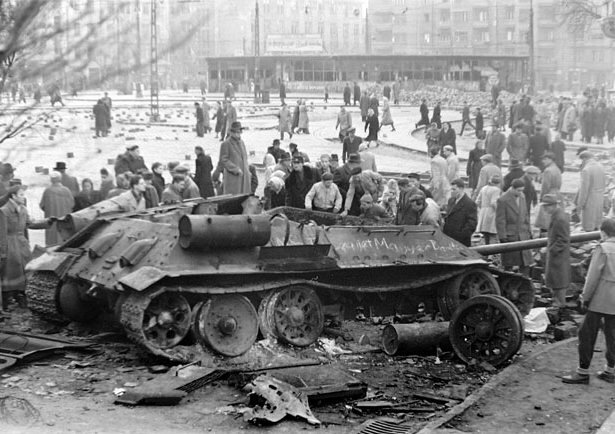 On November 4, Soviet tanks entered Budapest and fired on the protesters. Ultimately, 2,000 would die. The "Freedom Fighters" received encouragement from CIA sponsored radio. No further support was extended by Eisenhower or Secretary Dulles to the chagrin of the Hungarians. They recalled all of the lofty statements of American leaders supporting those who sought freedom. Eisenhower and Dulles expressed their sympathies. 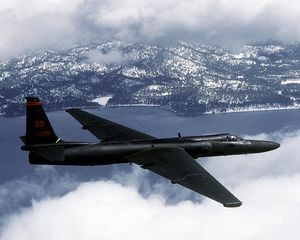 The introduction of the U-2 spy plane has left its mark in Cold War history. In July, 1956, Washington was convinced that there was a substantial bomber gap in favor of the Soviet Union. They sought confirmation. The spy plane could fly at an altitude of 70,000 feet and believed out of range of Soviet air defense systems. Ike was fearful that, if discovered, it could be construed as an act of war. However, the new First Weather Reconnaissance Squadron would operate with civilian pilots. The president was assured that if a plane was shot down there could be plausible deniability of any American military involvement. On July 10, 1956, the Soviet Union filed a formal protest and Eisenhower canceled further U-2 missions. The cold War landscape changed with Soviet actions during the Hungarian uprising in the autumn of 1956. U-2 flights were reauthorized requiring the president's authorization for each flight. Flights continued and were extended to the Soviet's Asian territory where radar installations were not as extensive as found in its westerly areas. By this time, it was reported that Soviet interceptors had no success in hitting the U-2. The worst case scenario, according to the military brain trust, was that the plane and pilot would be destroyed if shot down. No credible evidence would survive. This scenario was wrong. 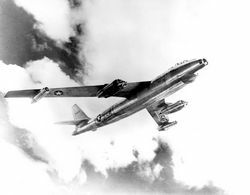 The missions were abruptly halted after May 1, 1960, when a U-2 flown by Gary Powers was shot down. He was captured and ultimately exchanged for a Russian spy imprisoned in the United States in 1962. American relations with the Soviets were reduced to measurable comparisons. Each side viewed any new development as an invitation to create bigger and better. In August 1957, the Russians launched the R-7 rocket on a 3,000 mile flight. Eisenhower had prior knowledge of the rocket site that had been photographed by a U-2 plane. The U.S. response was to place the Strategic Air Command (SAC) on a 24 hour alert, 7 days a week to defend against a surprise intercontinental, nuclear, ballistic attack (October 1, 1957). Constant air surveillance would last for 34 years. The Cold War had few moments of U.S. public hysteria that topped the news that the Soviets had launched a space satellite into an earth orbit. 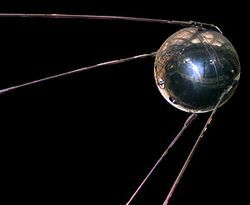 The Sputnik ("Fellow Traveler") was a 184 pound ball with a radio transmitter launched October 4, 1957. It was reported that President Eisenhower was quite sanguine, but the public outcry moved him to create Advanced Research Projects Agency as well as appropriating funds for research and scientific education.The ARPA would be precursor to the spectacular space successes of the N.A.S.A. (National Aeronautic andSpaceAdministration). Cold War History In 1954, Werner von Braun, a former German rocket scientist, was employed by the U.S.Army to develop the Redstone rocket in Project Orbiter. 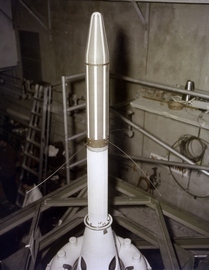 During the effort on the Redstone, von Braun proposed a model for a space craft using the Redstone with added boosters. The Orbiter program was shuttered in 1955, but the prototypical space design was adopted and the result was the launch of Explorer 1 on the Juno rocket on February 1, 1958. In the following year, Explorer 6 photographed the earth from its space orbit. In three months time, the United States had substantially closed the satellite gap. The scientific community was mobilized and schools were stressing mathematics and engineering in their curriculum. "In the late 1950”s President Eisenhower authorized a program to collect intelligence about the Soviet Unions Intercontinental ballistic Missile Program. The Soviets were bragging about their successful nuclear and ballistic missile technology yet we had no means to verify and/or assess their progress and compare it to United states efforts. Aircraft systems were limited and at best could only give us a peak at their activities. No one had ever attempted to build a system that could conduct surveillance and reconnaissance from space. The CIA in conjunction with the Air Force assembled an industrial team of experts in the latest technologies and were directed to perform whatever experiments considered necessary to design and develop such a system on an expedited bases with the utmost secrecy. This led to the very first space based system that successfully photographed the entire Soviet Union and then retrieved the film from space. The results of this effort proved that we were far ahead of the Soviets. It led to the creation of the U S National Reconnaissance Office and helped spur the technology which has supported all future systems by the development of technologies for military and industrial applications that we enjoy today". "The Russians launched the first sub orbital missile to travel an "intercontinental" distance and they were first to orbit a small satellite.The Nazis launched the first long distance missiles. All these missiles were unreliable and took years before they were effective and could be "weapons grade".The primary issue of the cold war was who had a reliable strike force and the Discoverer/Corona reconnaissance program established that we had a significant lead in most areas. The Russians could not afford to match us which caused them to agree to various limits and ultimately along with other reasons, their collapse.We won the cold war"! France joined the nuclear nations nuclear club in February 1960. The U-2 complication was unexpectedly overshadowed in June 1960 by a split between Communist China and former ally, Soviet Union. This added a potential foe on the Soviet border. The reason for the split was doctrinal with each claiming to be the successor of the Marxist ideology and therefore the leader of the communist world. A further blow to the communist cause was the defeat of "red" insurgents in Malaya. However, a neighboring country, Laos, was subjected to a communist inspired revolt by the forces known as the Pathet Lao. An example of the bumpy road that the Cold War inspired. Fidel Castro was a different problem for the United States. His take over of Cuba 90 miles from Florida was a potential threat to U.S. security. It was clear, even before Castro identified himself as a Marxist, that he was at odds with American foreign policy. Eisenhower empowered the CIA to train Cuban emigres for a potential invasion of Cuba. When Castro insisted that the American embassy staff be reduced, Eisenhower responded by closing the offices on January 3,1961. This confronted the new president, Kennedy, as he took office. Uprisings in Indochina fomented by communist groups was a harbinger of a new aspect of the Cold War that immediately faced the new president, John F. Kennedy as he entered the White House on January 20,1961. Retrospectively, Eisenhower was a reluctant supporter of the Truman doctrine of containment. He believed that honorable disarmament was the goal that should be pursued. In his farewell speech, he devoted its theme to the dangerous influence of the military industrial complex. He maintained that disarmament was an imperative to avoid war with the the Soviet Union. "Another war could utterly destroy this civilization". Protection of the precarious peace was passed to John F.Kennedy.